Free Shipping Included! 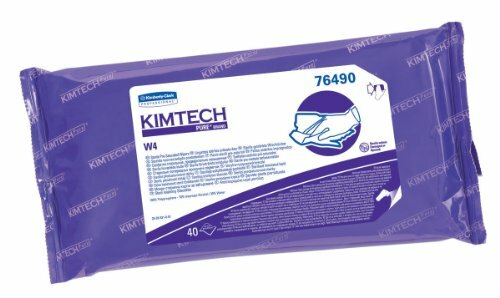 Kimberly-Clark Kimtech 76490 Pure Disposable Wiper with W4 Pre Saturated Sterile, 11'' Length x 9'' Width, White, (10 Pouches of 40) by Kimberly-Clark Professional at Blog Free Here. MPN: 76490. Hurry! Limited time offer. Offer valid only while supplies last. 70 Percent isopropyl alcohol. 30 percent deionized water. 100 percent polypropylene. Ideal one-step application of alcohol to critical surfaces. 70 Percent isopropyl alcohol. 30 percent deionized water. 100 percent polypropylene. Ideal one-step application of alcohol to critical surfaces. Contains semiconductor grade alcohol. Resealable pouch with case liner. Recommended for the most critical wiping tasks in ISO Class 4 or higher cleanroom environments. White color. Measures 11" length by 9" width.